Learn Java in 9 Tutorials - Basics & Data Structures with Exercises! Are you here because you want to learn Java? Then you are at the right place! 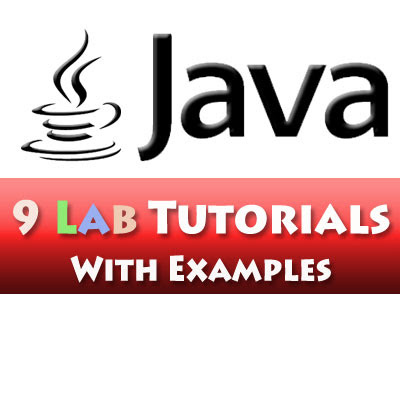 These Java laboratory tutorials are truly for beginners, so you do not have to have experience at all! Even if you know a different programming language, these will help you get started to learn Java quickly so you can begin coding right away. The tutorials below were prepared by myself for a course that I TA'd for. Therefore, I know how confusing it can get when you just started to learn a new programming language. Do not worry! These tutorials will guide you through the process of learning Java FROM SCRATCH. Before we start, you should download the required exercise files and quiz solutions from the button below. Alright, enough talking! Let's get started! The first tutorial is going to be an introduction to Java and its syntax. The tutorial starts with basic examples such as printing out a String and ends with some quiz questions for you to practice what you have learned. Also I provided the download links for the Integrated Development Environments for Java Programming. The rest of the tutorials will follow the same content-quiz pattern so get ready for some hands on experience! In this second tutorial, I walk you through the two different data types in Java: Primitive and Reference. Then, I mention type casting and explain implicit and explicit type casting. Lastly, I explain the Object concept and finish with an Object Oriented Programming example and a quiz question. In the third tutorial I explain the difference between the equals operator and the equals() method. Then I further delve into documentation, JUnit testing, array manipulations and more on objects. Lastly I investigate the class methods versus the instance methods, static versus non-static and immutable objects. In this tutorial I talk about the fundamental inheritance concept, I explain and compare abstract classes with interfaces, and touch a little bit to the concept of Graphical User Interfaces in Java. Also I provide an example game project called Puzzler for you to practice on. In the fifth tutorial, I mention generics, interface instances, stacks and I review the Inheritance concept. In this tutorial, I take you through an important feature of Java: File Operations. We are going to take a look at Character and Byte Streams, some built-in Classes and their functionalities to be able to perform file operations. Then we are going to learn about a famous concept called exception handling. We are going to finalize this tutorial with Number Formatting. In this tutorial, we have finally come to one of the most famous frameworks of Java: Collections Framework. We will take a look at the Lists, Sets, Queues and their types through examples. In this tutorial, we discuss the Iterators that enables to cycle through the elements of a collection. Then we check out the nested classes and complete the tutorial with Maps and some exercises. In this tutorial, I cover recursion and Binary Trees. I also give some exercises on these topics. Congrats guys! You have reached to the end of this series of tutorials! I encourage you to take the self evaluation test that I have prepared for you to test your knowledge.. Good Luck! What do you think about these tutorials so far? If you liked it, please leave a comment and share your opinions below! Would you like even more tutorials, more help, more example programs, and more tips to help you learn Java? If your answer is yes, then I recommend subscribing for our newsletter. It is packed with snippets, projects, and other Java related topics, all for free. So make sure to sign up today!